Saucier + Perrotte / STGM architectes + Pasquin St-Jean ing. Anne Carrier Architecture / Lupien + Matteau inc. / Groupe S.M. international inc. The history of "Nouvelle France" describes the event when Jacques Cartier mistook the shining quartz stone on a cliff as precious stones, hereafter naming the cliff "Cape Diamond.” Another theatrical story, "Le Diamant,” is a competition to design a space for creation that started in 2007. It was launched by Robert Lepage, the theater director and founder of the Ex Machina Company who envisioned a theatre of six hundred seats, intended for the creation and diffusion at a national and international level. As planned by Robert Lepage, "le Diamant" was designed to be a catalyst for artistic innovations, containing studios and equipment intended for contemporary creations, for the circus, the cabaret and the initiation of a new entertainment district. On top of all this, the space needs to accommodate for Ex Machina’s production. For this project, the first site to be considered was in fact Cape Diamond; a hill overhanging the Saint Laurent River and a stronghold of Quebec’s citadel. After several years of uncertainty regarding the project funding, the competition was launched during the summer of 2015. The jury was chaired by Robert Lepage along with Ex Machina’s producer, Michel Bernatchez, the historian Luc Noppen, and the architects Jacques Bellanger and Charles-Bernard Gagnon (Gargo architecture). Lise Anne Couture (Asymptote architecture) initially sat on the jury but withdrew in the end. The chosen site is conveniently in front of the busy Youville plaza, at the foot of the Quebec fortifications. Mayor Regis Labeaume believes that this square has the potential to become the new heart of the entertainment district. Seemingly ideal, the site is not without difficulties due to the adjoining condominium and the existing YMCA built in 1879. As required by the Ministry of Culture, these existing facades need to be preserved. This coincides with Robert Lepage’s vision, that of the importance of maintaining the YMCA, a place of art that has always played a cultural role. Altogether, the four teams did not manage to justify the preservation of the facades. Because of this prescribed obligation, the value of each proposal could not be captured to its full potential, explaining the general homogeneity with regards to the conservation, demolition, installation and volumes. For the first stage of the competition, the jury selected four teams among the 17 submitted applications. - Anne Carrier Architecture / Lupien Matteau and the S.M. Group International Inc.
- Co architecture / in Situ/ Jacques Plante architecte and BPR/ Tetra Tech inc. ing. - Saia Barbarese Topouzanov architectes and WSP ing. - Saucier Perrotte / STGM architectes and Pasquin St-Jean ing. -	Access to the theatre’s lower rows located on the ground floor along with a commercial concourse with shops facing the plaza. -	A mezzanine foyer that overhangs the shops, besides the theatre’s upper rows. -	Located between the YMCA and the theater, a void for the staircase leading to YMAC’s rooftop. Anne Carrier Architecture / Lupien Matteau’s proposal remains the most unique as it challenges the question and program. The project reinterprets the question at a human scale, giving impetus to the mayor’s will that this neighborhood becomes the “entertainment district.” The layout proposed is comparable to Montreal’s “Place des Arts.” The project also adopts a new position regarding the programmatic elements and the operation of the theatre’s first floor. 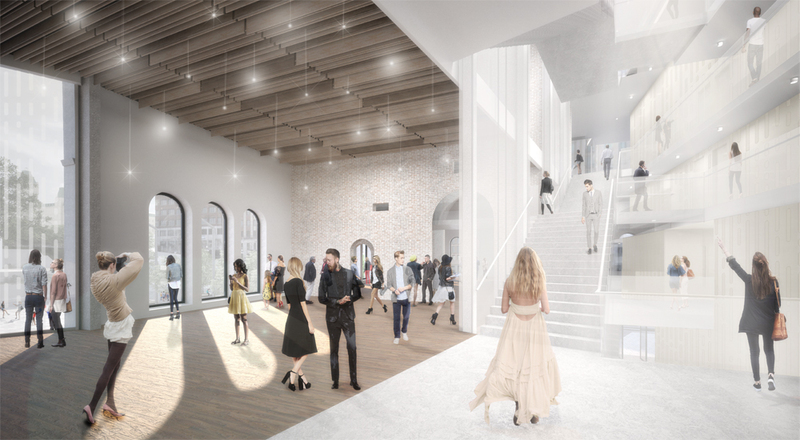 The jury’s two leading projects are very similar in terms of volumes and operations; they both presented the theatre foyer inside the YMCA, placing the staircase in between the existing and new buildings. Unanimously picked, the winning project evokes a prismatic lantern inserted between the YMCA remnants and the neighboring building designed by Co architecture / in Situ / Jacques Plante architecte. To the jury’s satisfaction, the project answers to the request for a diamond, by a diamond. Literally speaking, the volumes are trimmed by oblique surfaces, with translucent and white facade. The visual supports depicted a shiny interior universe, while the presentation text gave even more reason to choose this simple and expected proposal. In a Radio Canada interview on December 9, 2015, “Un Diamant contemporain dans un édifice patrimonial,” Marie Chantal Croft from the Coarchitecture office states: “Transparency is a widespread way of working in a historical environment because it is less offensive than other materials because it does not have a strong presence. Instead, the glazed sections fade and give way to the historical context.” Signs of a skilled team, this proposal went into greater detail of the theatre’s technical operation and also presented the thermal comfort of the building. The project by Saia Barbarese Topouzanov architects presented a theater curtain that hides the stage house between the YMCA and the condominium. The escalator unravels like a ribbon along the entire height of the central void. The foyer seems to take less space compared to the other proposals. A topographical section communicates the relation between the studio 1’s terrace on top of the YMCA and the fortification’s terrace. The honorable mention, by Saucier Perrotte / STGM architects, is a knowledgeable set of proposals oriented towards different urban situations which produce an architecture that is slightly overloaded. The jury criticized this project for its poorly elaborated descriptions. The street facade is stratifying revealing every level with shadow gaps which, as stressed by the jury, elegantly evokes YMCA ornamentation. A large loggia, for which the accessibility is unclear, expands as a cantilever on top of the YMCA terrace. An urban overhead mirror of this loggia communicates the association between this terrace and the public space. Swiveling between the two facades, this bay window encloses management offices. Reflecting on this competition, it is clear that the prescriptive element of the YMCA led to the homogeneity of the proposals; a disappointing conclusion for a building holds a great deal of importance and is well-situated in Quebec City. Regrettably, as Jimmy Leiser wrote in an analysis published in ARQ in August 2016 (note 2), the winning project was modified after the competition, mainly by adding extra surfaces truncating the prismatic lantern, reinforcing, if it was necessary, the diamond symbolic. The competition’s double issue was, firstly, to properly pay tribute to Robert Lepage, an internationally renowned playwright, and secondly, to mark the beginning of a new entertainment district at the foot of the fortified city. In this case, the clients held the chief authority over the project. As authorities on the subject, these adamant stakeholders enforced limiting rules that left the four teams with little room for exploration. After years of intense activities on the international market, Ex Machina wishes to ensure a significant presence in Quebec through a permanent and flexible venue at the technological forefront, which will showcase the world's best creations to regional, national and international clienteles: The Diamant. The Diamant will host not only Robert Lepage and Ex Machina productions, but will also show circus and opera as well as innovative artistic proposals. Indeed, in its programming, the Diamant will focus on inventive stagings, mixed disciplines and proposals that revolve around the explorations of theatrical forms. The artistic vision guiding the Diamant corresponds with the mission of Ex Machina which is constantly looking to develop new scenic languages and a different relationship to the representation. Acquired by the Diamant in 2011, the site is located at Place d'Youville in the heart of the historic district of old Québec. It is currently occupied by the Cabaret du Capitole (formerly the Cinéma de Paris built in 1948), by Jac & Gil Smoking and by the old YMCA building, constructed in 1879. The site is landlocked between the Des Glacis Condominiums on the North side and the Théâtre Capitole on the East side. St-John and Des Glacis Streets are respectively bordering the South and West sides. The site's dimensions are approximately 32.7 meters wide by 58.1 metres long, including the area occupied by the YMCA. The new project involves the complete demolition of the Cabaret du Capitole and the Jac & Gil. As the MCC requires the conservation of the three (3) facades of the old YMCA on Place d'Youville and the Des Glacis Street, the conservation or the demolition of the structure of this significant building is still an option. The actual entrance to the Cabaret du Capitole overlooks the Place d'Youville between the Capitole Theatre and the YMCA building. Two (2) restaurants, which deploy their terrace in summer, occupy the ground floor of the YMCA; this function will be maintained. This site is facing the Place d'Youville, occupied by a skating rink in winter (from November to March) and by one of the scenes of the Summer Festival. It is a place of entertainment important to old Quebec. The Diamant will therefore occupy an exceptional and unique site in Quebec, adjacent to three fronts to Place d'Youville, in joint ownership with the Théâtre Capitole de Québec. Given the strong vertical drop of the site, the five facades of the project will be visible (including the roof), in whole or in part, from different points of views of the city of Québec. Indeed, the very steep topography of the site and the configuration of the surrounding streets will allow pedestrians to enjoy the building from many points of view. Therefore, the project acts as a landmark and acquires an architectural significance in the urban landscape. Located in the heart of the historic district of old Québec, classified world heritage of the Unesco, the Diamant project will have to respect the regulatory requirements of the zoning by-law in this sector, but will also match the architectural guidelines developed by the Ministry of Culture and Communications, which has jurisdiction in this medium. The personality of a place is reflected in its architecture: the choice of volumes, styles and materials express and clarify its identity. It is an opportunity to make a gesture that will cross time. Thus, it is important to take the time to think about what vision should be conveyed throughout the project. In the case of the Diamant, several elements are blended to build a collective identity, a signature of Quebec City. Different types of architecture mingle on Place d'Youville, including the art deco style of the hall of the old Cinéma de Paris, rare in Quebec. This natural crossroads of Québec was the witness of all periods in the history of the city. The architectural concept of the project must marry modernity with the heritage of the past. The buildings of the Diamant project and the Place d'Youville have accumulated various functions: shops, bars, halls shows and cinema, catering, sports (swimming pool, bowling alley), accommodation, exhibitions, public market, gatherings, etc. It is considered important to mention the patrimonial aspect of the buildings, but also of the Place d'Youville itself. The Place d'Youville is at the heart of Quebec City, the meeting point of the lower-city of Saint-Jean-Baptiste and old-Quebec, ingrained on Cape Diamant. The Capitol, the Palais Montcalm and soon the Diamant are all interacting in this sector. Therefore, we realize that both the Diamant and the Place d'Youville are hubs amalgamating a multitude of elements, reflecting the fusion of the disciplines in the work of Robert Lepage. Hence, the Diamant architecture should act as a bridge between all of these elements. The architecture is both a salute to the past and a look towards the future, a symbol of history and an expression of the identity of the place. The idea of 'temporal crossroad' is expressing this vision.